Two teams from Utah took top honors in the first-ever VEX Robotics Competition in Idaho, held Saturday at Wood River Middle School in Hailey. Wood River High School's team, which hosted the event, won the "design" award, but placed low in competition because of technical problems with their robot. "We had some electrical problems that we couldn't solve," said team advisor Kevin Lupton, an instructor at the high school's Architectural and Mechanical Design Academy. Placing first was Design Academy, a high school robotics group sponsored by Utah State University. Second place went to a team from Mountain Crest High School in Hyrum, Utah. Lupton said Design Academy and the Mountain Crest team worked together as an "alliance" in the competition, but that Design Academy won the excellence award, giving it first-place honors. Both teams won $500 awards presented by the U.S. Air Force, which sponsored the event along with VEX Robotics Design System, a company that designs and builds components for robots. 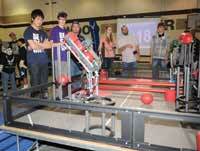 Both teams also qualified for a regional competition to be held in February in Logan, Utah. By winning first place, Design Academy qualified for world competition to be held in April in Anaheim, Calif.
Thirteen teams from Utah and Idaho competed in Saturday's event, which tested robotic skills of student-designed machines. Competition varies from year to year, but this year's event required robots to place balls and cylinders in elevated goal posts. The Wood River High School team won regional competition in 2010 and 2011 and attended the world event both years, but was disappointed by the performance of their machine at Saturday's competition. "The tournament went really well, but we didn't do well at all," Lupton said. "We kind of got smashed around. "But they're going to redeem themselves," he said, explaining that the team has three more competitions it can attend to qualify for regionals. Nonetheless, Lupton said he and the team are proud of winning the design award, which is based on overall concept and not on competition results. "I had other mentors at the competition tell us that they were impressed with the design my students attempted," Lupton said. "They just had technical issues." A group of fourth- and fifth-graders from Bellevue, Hailey and Woodside elementary schools demonstrated their "Lego" robotic skills at Saturday's competition, after competing themselves at a Lego League 2011 Challenge on Nov. 5 in Twin Falls. The students, enrolled in the Blaine County School District's Gifted and Talented Education program, typically referred to as GATE, were the only elementary school students competing in the Twin Falls event, but did well against seven other middle school teams. The Blaine County students formed two teams, the Wood River Spuds and the Eggheads, with the Spuds finishing third and the Eggheads finishing fourth. "It was their first year and I'm really impressed how well they did," said Kathy Baker, a parent who assisted GATE teacher Kristy Turco as a coach. "They put in about six hours a week on this—it was a big commitment for them," she said.